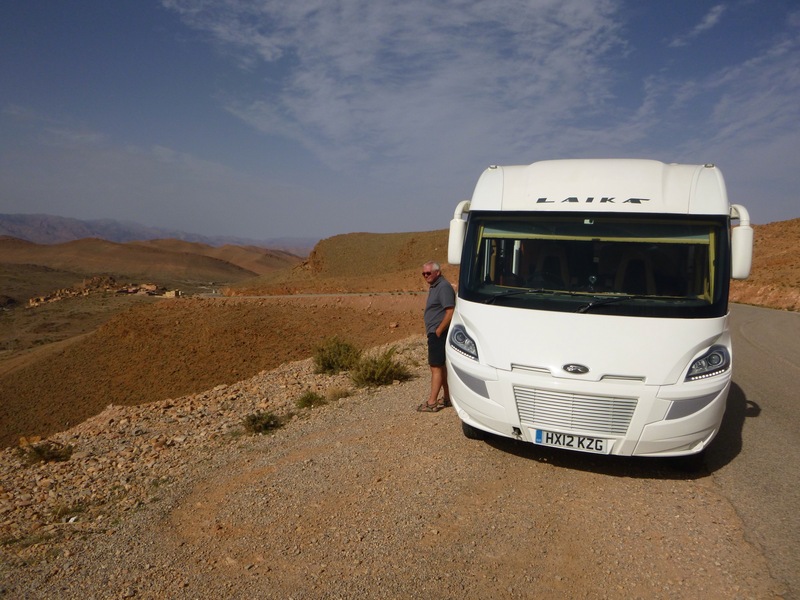 We spent our last night in Morocco at a very dubious site about an hour’s drive from the ferry port at Larache. 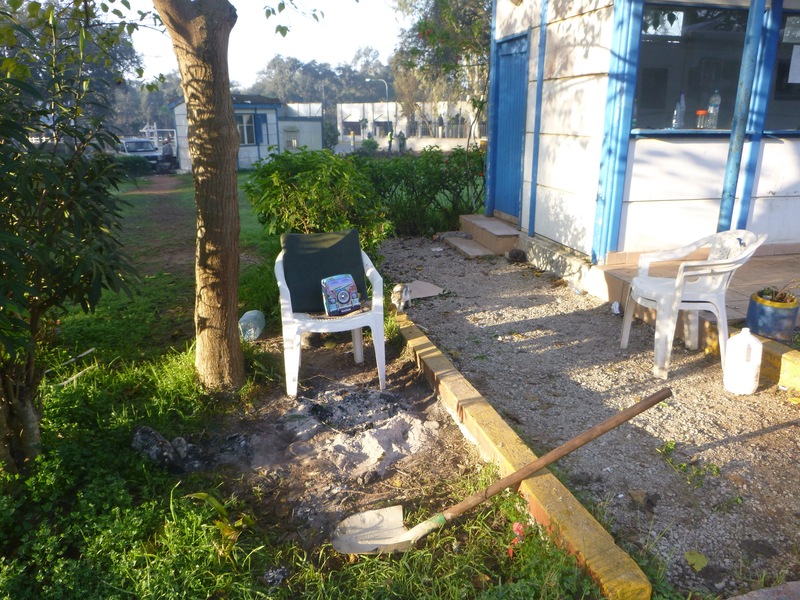 The site looked OK in the book but turned out to be a disused park, the toilets were derelict and there were a few dilapidated huts with groups of men sitting around, one of whom showed us to a parking spot close to a shabby office. When I enquired about security the guardian assured us that he would watch over us all night. One other camper van (Italian) joined us later that evening. Surprisingly we felt reasonably safe and, although we didn’t leave the camper van all evening, we passed a reasonably peaceful night. As far as we could tell the guardian spent the night in a plastic chair lined with a sheet of cardboard for insulation and a small campfire to keep him warm. We arrived at the ferry port at Tanger Med in good time for the ferry to Algeciras at 12 noon. That ferry left at 11.30 am before we had completed all the security checks, so we caught the next one a few hours later. 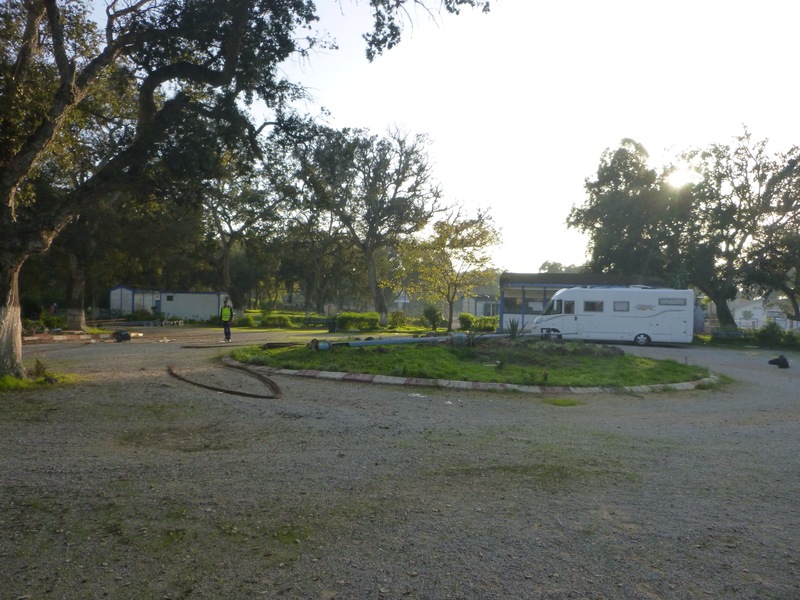 Half an hour after landing in Spain we were settled in at La Bella Vista camp site, next to the beach and with hotel grade facilities – what joy! 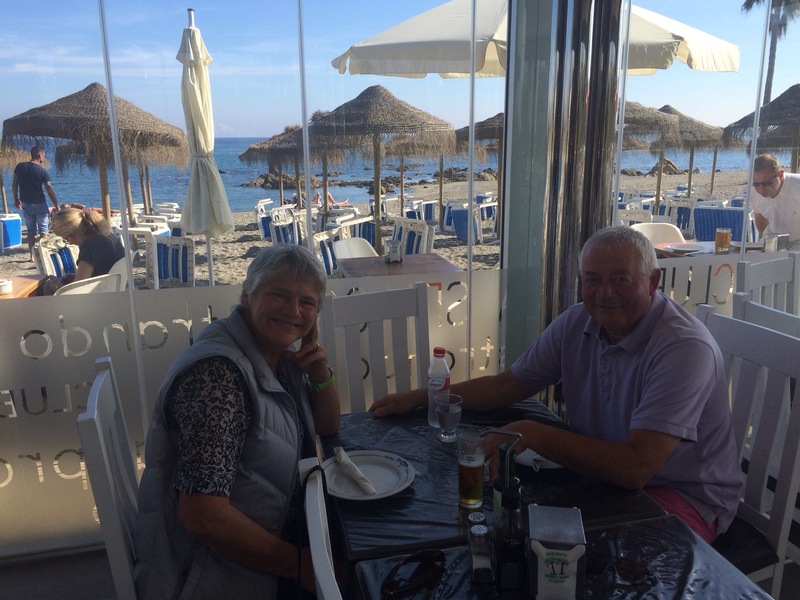 Unfortunately the site was filling up with British “snowbirds” who were arriving in their droves to winter in the Spanish sunshine. When we spotted the staff installing a plastic Santa on the roof of the restaurant we knew it was time to leave. 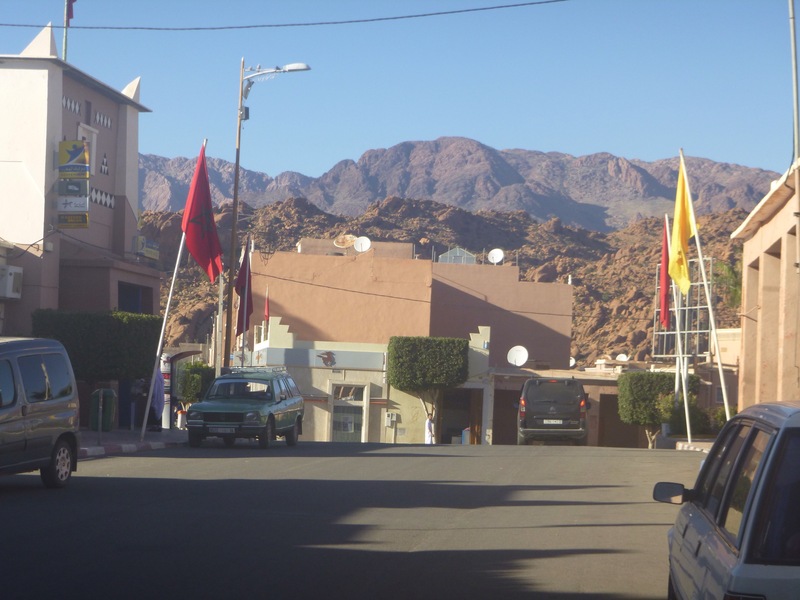 We stayed overnight in the town of Midelt, 5000 feet above sea level between the High Atlas and the Middle Atlas. 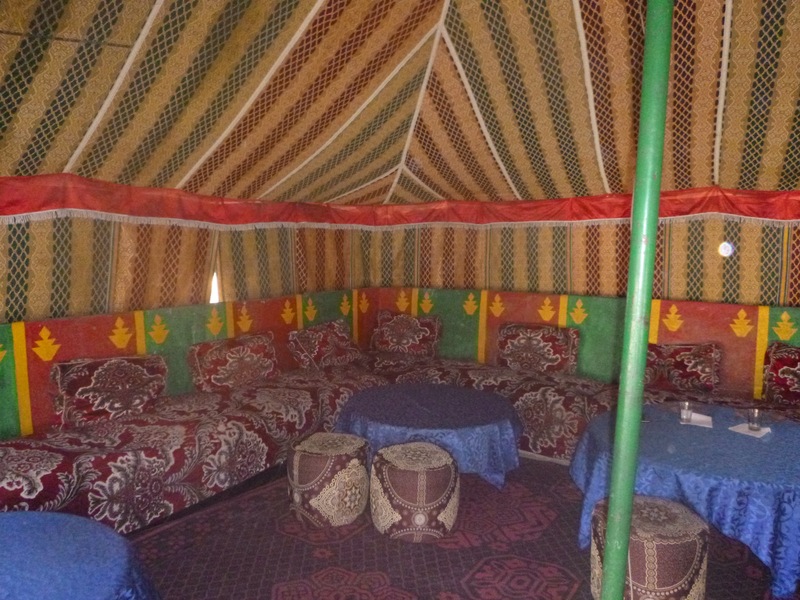 When we arrived at the campsite the guardian invited us to take tea with him, he spoke very good English and asked if we had any goods we wanted to swap for a nice Berber carpet (no thanks). He also asked if we had gifts for his family – we gave what we could. I told him we needed bottled water and fresh milk and these were promptly delivered to our van after tea. Due to the altitude, the temperature overnight dropped to 0.5° and by the time I walked to the shower block in the morning it was still a chilly 2°. When we left Midelt at 9.30 am it was already 15° and rising. 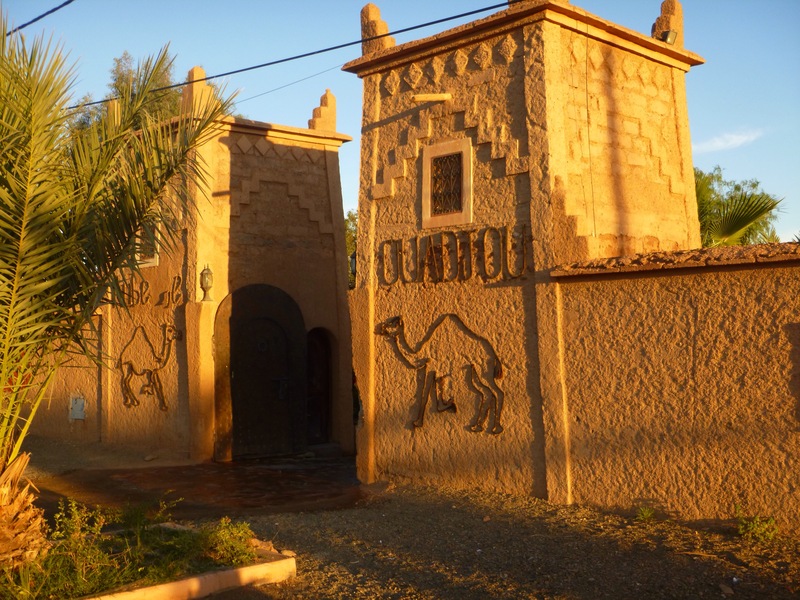 We were much less squeamish about toilet facilities than when we first arrived in Morocco and we found the campsite facilities adequate. The water in the shower was boiling hot but the shower head was partially blocked and only let through a fine spray of scalding water. I tried another stall and managed to get a reasonable shower – but having to make continuous adjustment to both the hot and cold taps. Some fresh blue paint had been applied to the walls but no-one had bothered to repair the broken window or replace the absent wash basin. 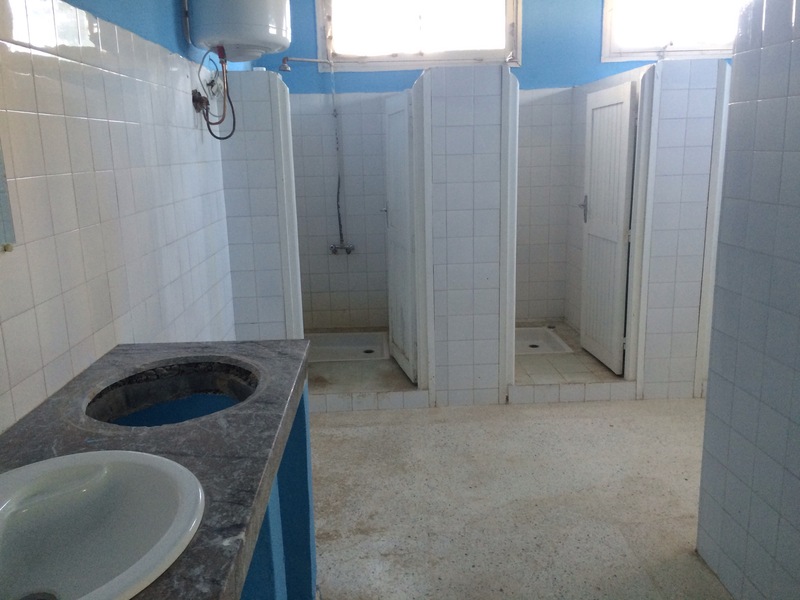 But we have seen worse and these toilets smelled OK.
As we continued our journey north the sun got higher in the cloudless sky and the temperature climbed above 27°. 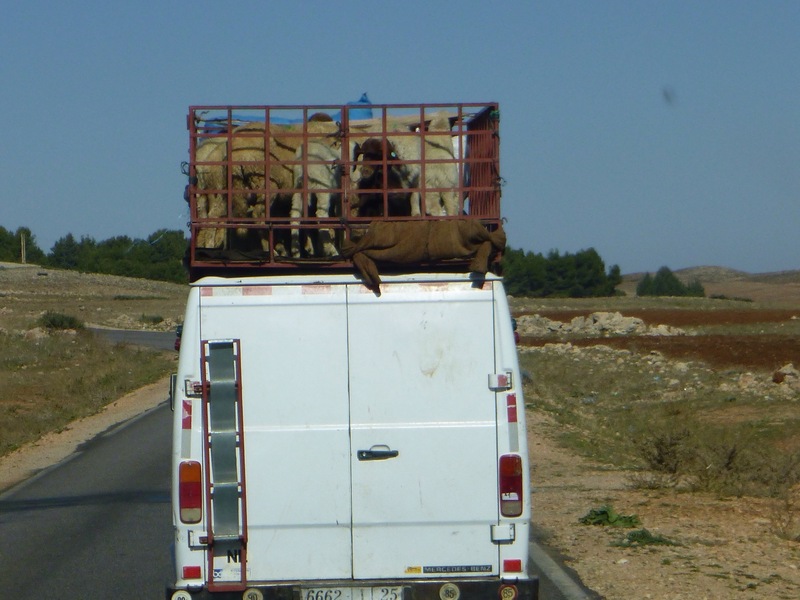 The driver of the van in front had to stop to rearrange the animals on the roof as some of the sheep lying down were in danger of suffocation. 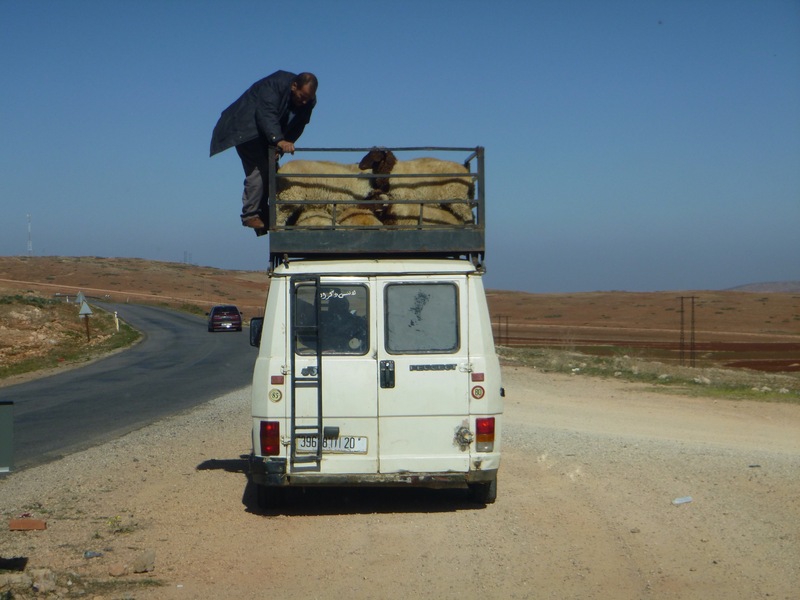 On the subject of animals, everywhere in Morocco we saw groups of dogs on the outskirts of towns and along the motorways, apparently running wild and many of them extremely emaciated. When I asked our taxi driver about these dogs he warned us to carry a stick with us when out on our bikes in case we were attacked. He said a ten year old boy from his village had been bitten on the arm by a dog and had later died of rabies in a Casablanca hospital. He told us the authorities came to his village and shot all the stray dogs. We were driving north on a road we had travelled before and, by chance, we recognised an art gallery and gardens run by Zaid, a Berber who had studied art in Paris. 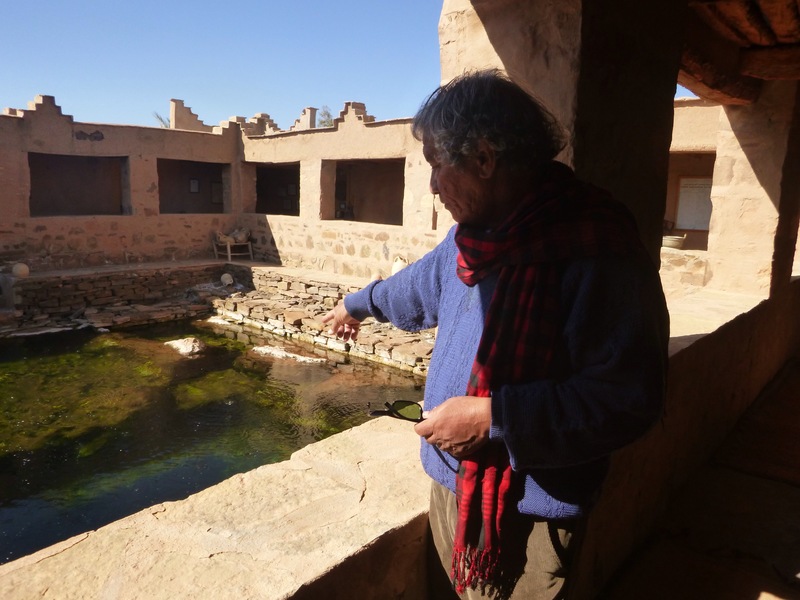 Zaid was an artist, a conservationist and a student of philosophy; back in the 1970s he found some desert springs covered with years’ accumulation of rubbish. He spent many years clearing the area and building a garden. 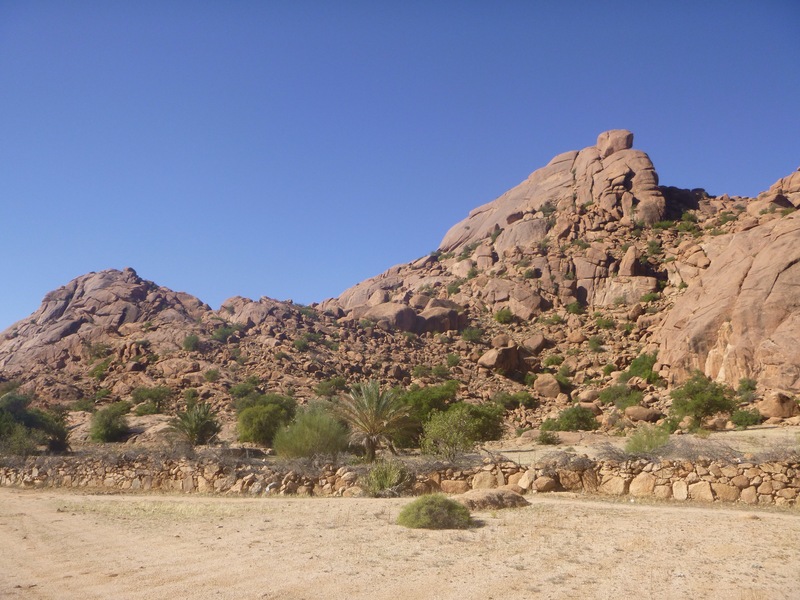 He dug out the springs, known as Sources Lalla Mimouna, and created three pools. 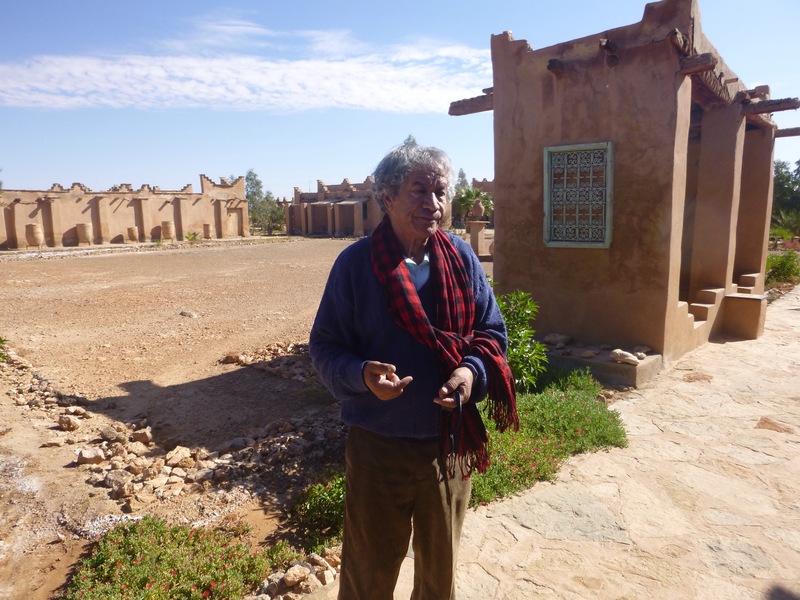 On the site he built a museum displaying the ancient artefacts of the Berber tribes, the indigenous people of Morocco. Rest in peace Roger who passed away 10 am 15 November 2015. Sail away old friend. 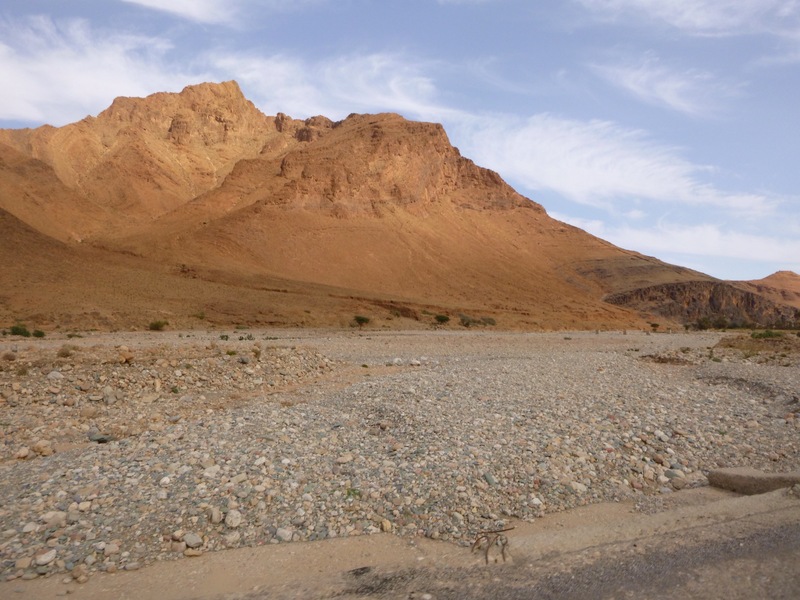 The N12 road heading east from Tata to Foum Zguid was a good road following the course of a mostly dry river along a valley. 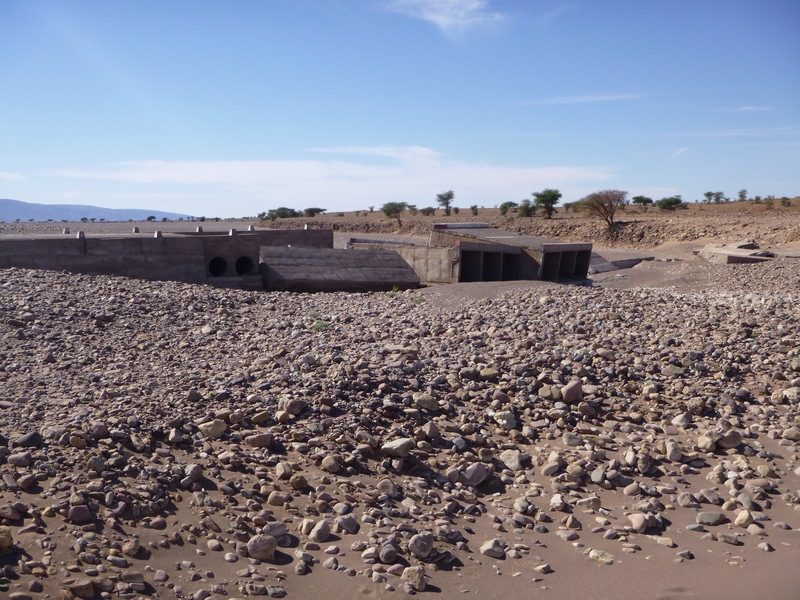 The road crossed and recrossed the dry river bed and we came across a bridge that had been totally destroyed by the force of water – which was hard to understand as everything was so dry. But the evidence of violent water was there as we crossed on a newly constructed bridge adjacent to the destroyed bridge with its huge concrete components tossed into a heap like a bunch of Lego bricks. 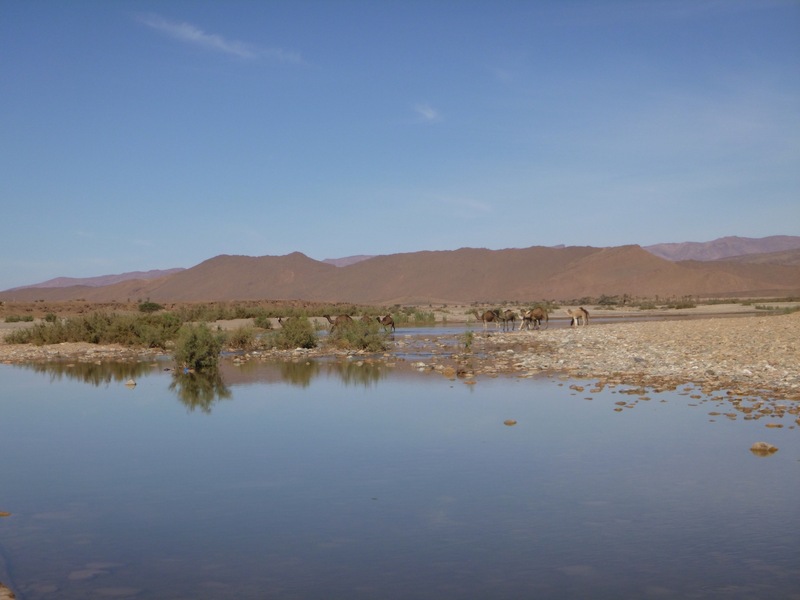 According to our map, the road from Foum Zguid to Zagora across the northern edge of the Sahara was just a dirt track along a river bed, even the TomTom navigator refused to accept the road as a viable route. However, when we spoke to the man at the local petrol station, he assured us that the road was now in good repair but it was a leap of faith when we set off. 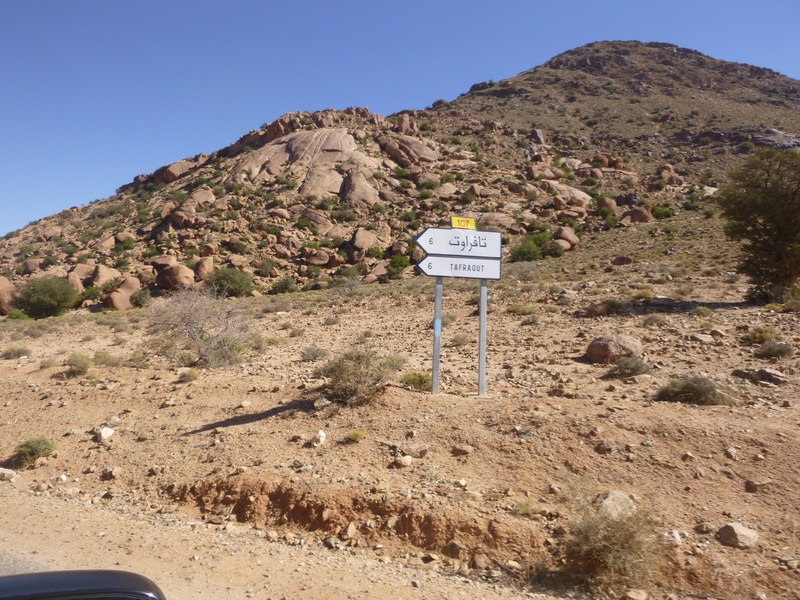 The road turned out to be fine and we reached Zagora a couple of hours later. 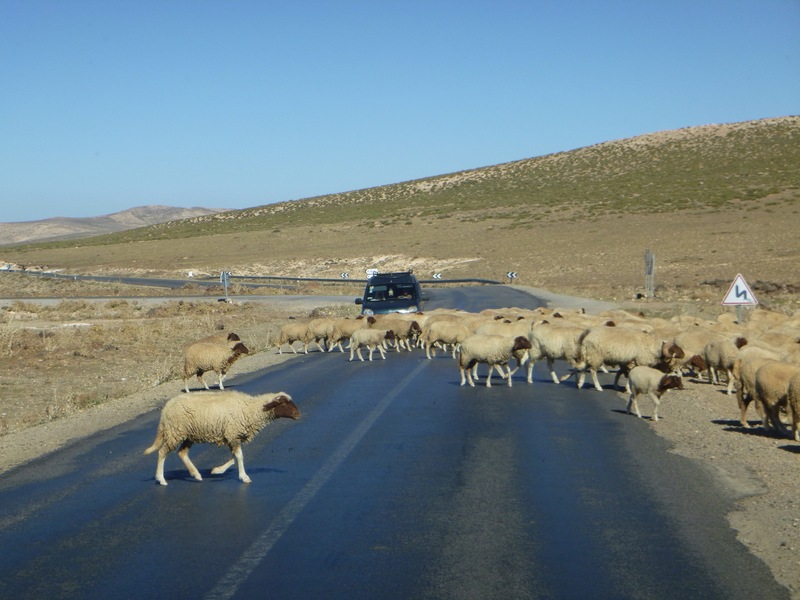 Although the road was quiet and the surrounding countryside appeared deserted, if we looked more closely we could see herds of goats grazing in the scrub watched over by their keeper. 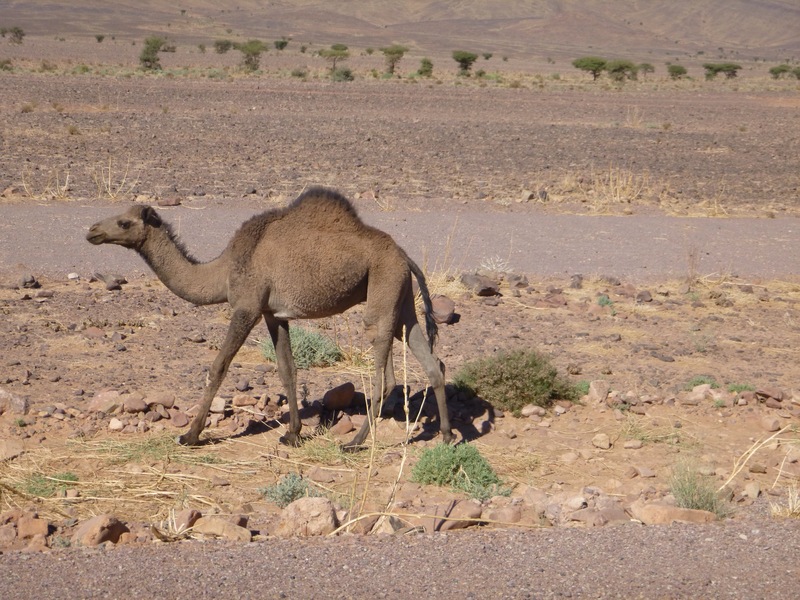 We also spotted groups of dromedaries (previously referred to as “camels” but I think camels have two humps and these only had one. Also on menus we regularly saw the word dhromederie). the gateway was 3 metres wide and our van was 2.7 metres. 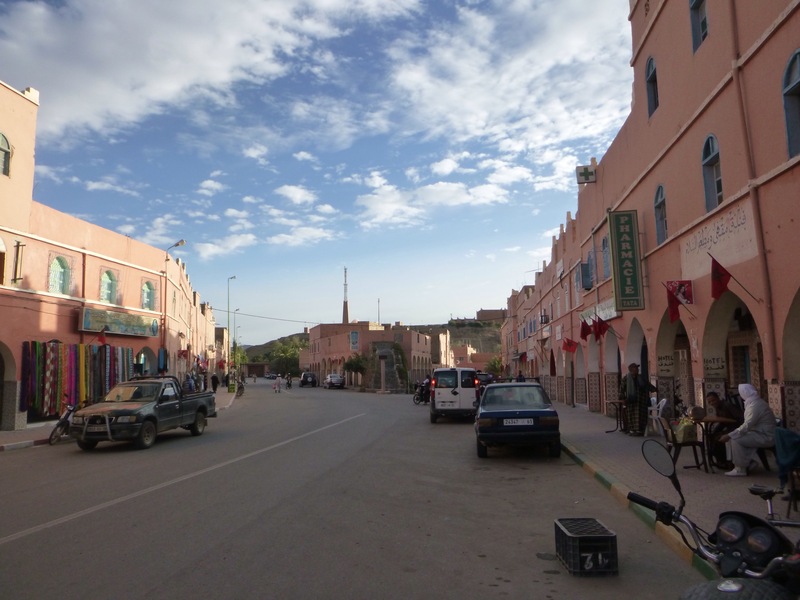 The guardian was a 19 year old Berber lad who brought us a pot of mint tea and sweet biscuits once we had settled and were sitting outside enjoying the evening sunshine. Once the sun went in the temperature plummeted from 27° down to 5° overnight. When we were ready to leave at 9 am we looked in the gatehouse office for our host but could find no sign of him – until he suddenly appeared from under a pile of blankets. He had been fast asleep, fully dressed but totally hidden from view, blankets pulled right over his head. Poor chap was still half asleep when he took our money (£7) and helped us manoeuvre out through the gates. 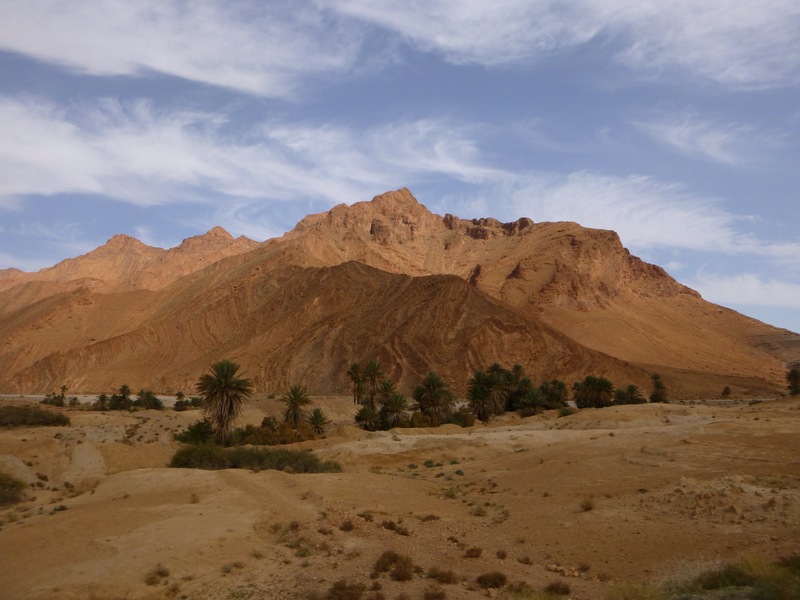 The drive from the Anti Atlas to the Sahara plain was stunning. As the crow flies we only travelled 65 miles east but the distance we covered was more than double that. 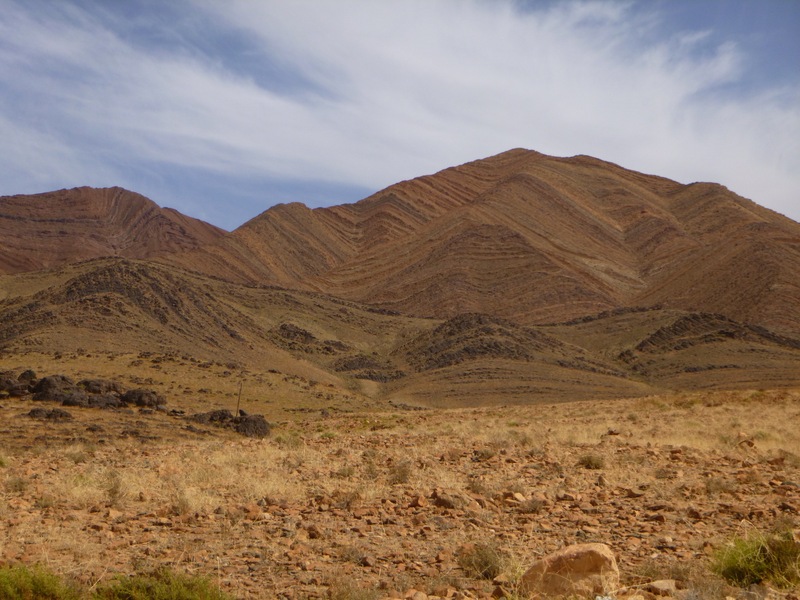 The spectacular mountain scenery gradually changed from high mountains with their granite peaks to softer hills but the palette of colours remained the same – red, terracotta and ochres – bright in the sunshine set against the blue sky, softened with the occasional wispy cloud. 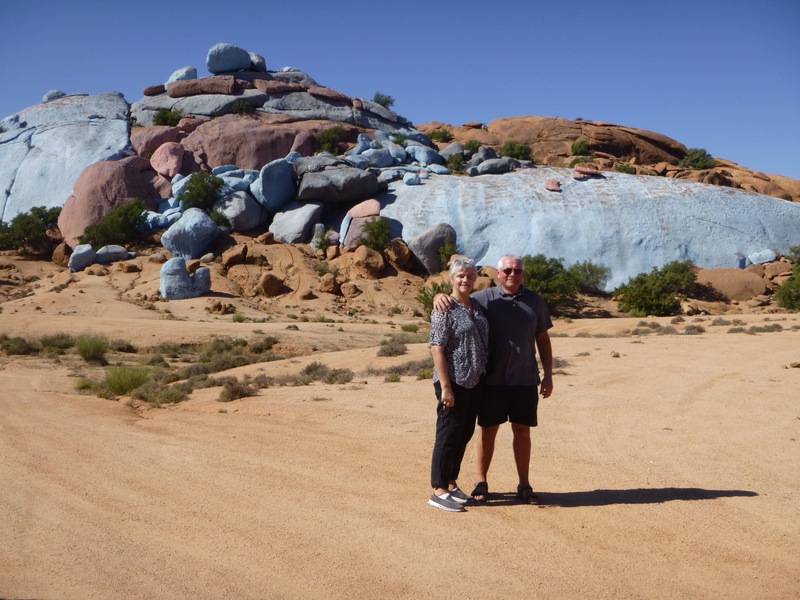 We stopped often during the drive in order to enjoy the views and to take photographs. 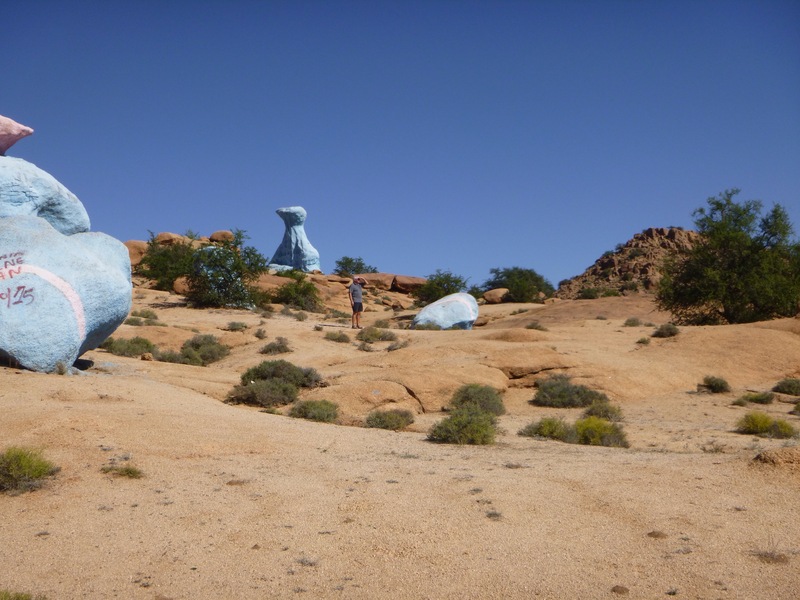 Sometimes we felt we had landed on some distant planet or it was as if we are standing in the middle of a film set – a weird science fiction film or, perhaps, a western where the galloping horsemen would appear in the distance raising a dust trail with their horses hooves. 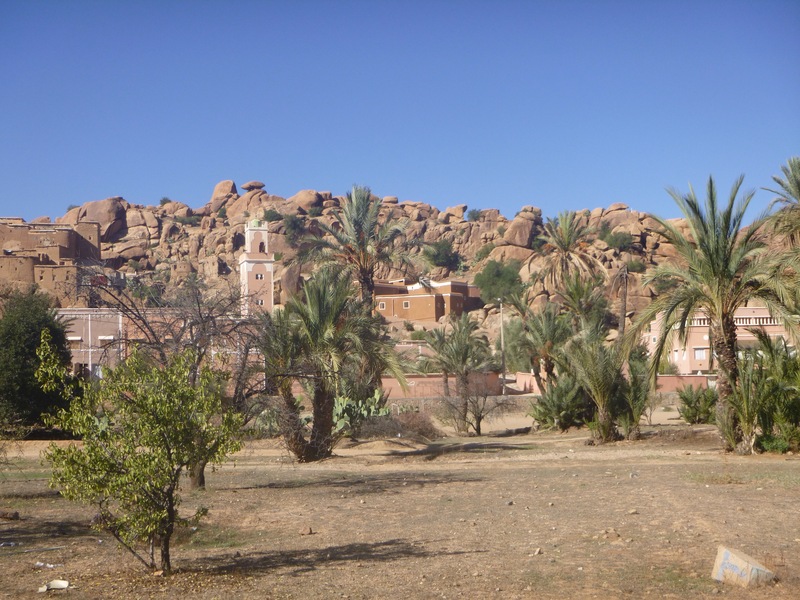 Eventually we reached our destination, Tata, a traditional town on the Sahara plain where most of the men and women in the street were wearing robes. We walked along the main street to get something to eat. 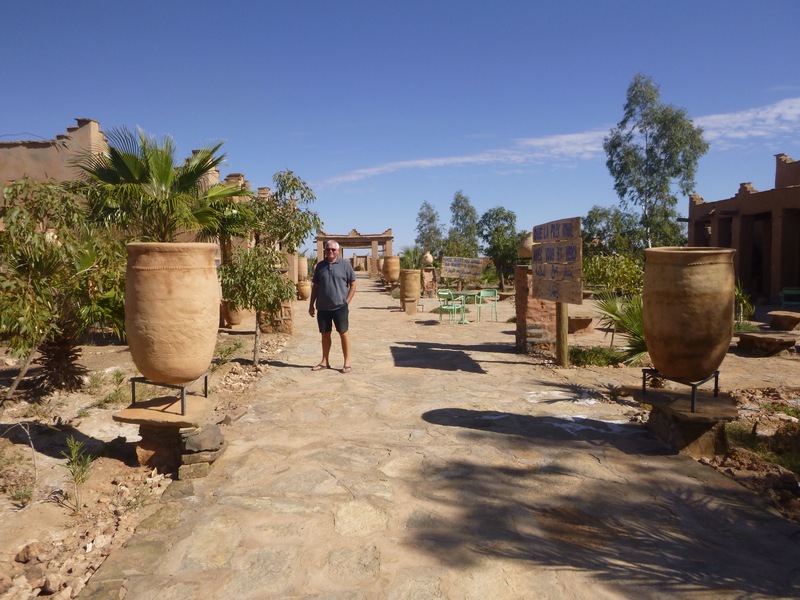 You will be surprised to hear that we had salad, chicken tagine and fresh fruit and it cost less than £10. On this occasion we were offered chips with our chicken tagine and we thought this would be a nice change; when they took the lids of the individual tagines, there were the chips laid over the top of the chicken! We watched an old man cooking nuts in a steel drum over a flame. We bought a cone of roasted, salted cashews for 70p. They were delicious. On a domestic note – the campsite had a washing machine in one of their outhouses so I took the opportunity to do a load of laundry but didn’t get it pegged out until 3 pm. The sun set at 6 pm so I had hardly any daylight drying time – and there was no wind. 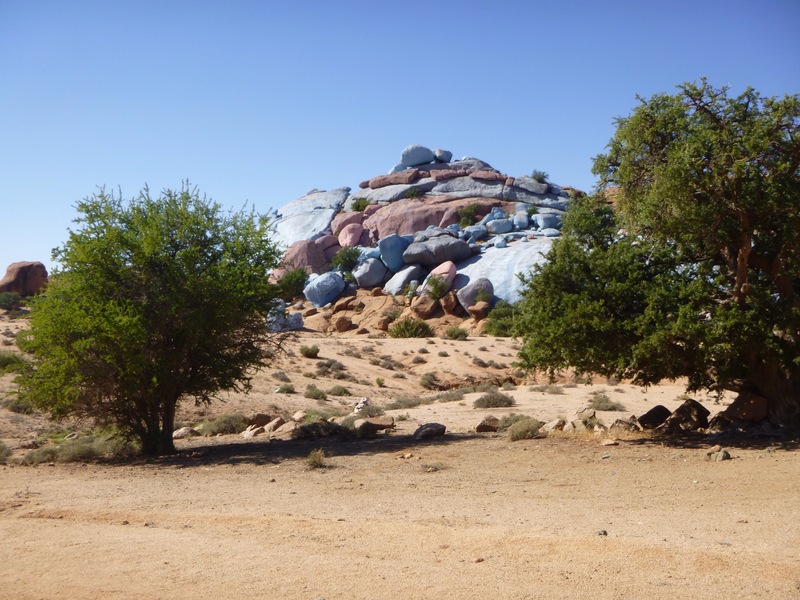 I left the laundry on the line overnight and at 9 am the following morning everything was bone dry, even Tony’s thick polo shirts – that’s the desert for you. The maximum daytime temperature was 28° but dropped to 9° overnight.